The NCRS has an amazing program for its membership. 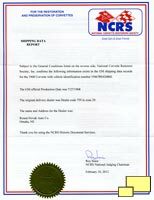 Go to ncrs.org/services.php and you'll see the "Shipping Data Report Service". For $40.00, and your VIN, they will send you a report listing the dealer code, dealer name, dealer address and the date the car was produced. The info is available for 1962 through 1975 Corvettes. Message board postings on the subject indicate that there are some gaps in the information, so the info is not available for all Corvettes. 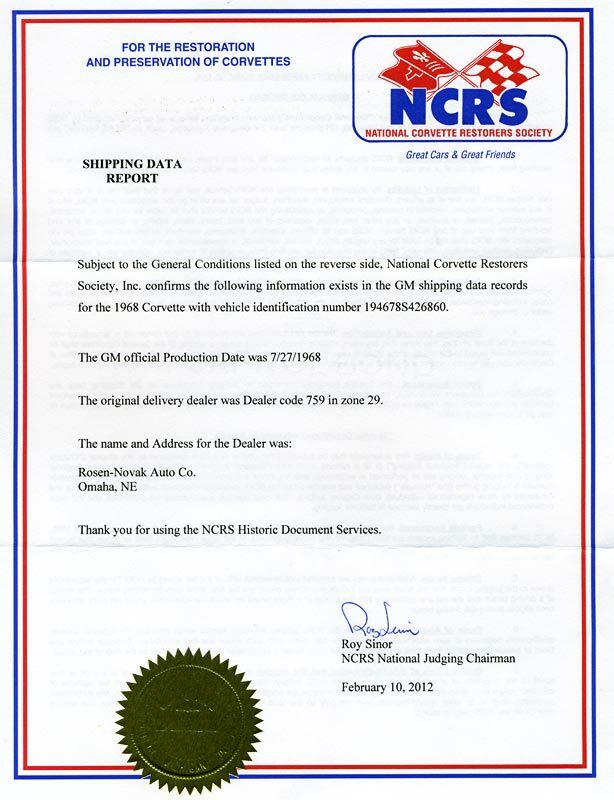 It's a valuable service that can give owners a starting point when researching the origin of their Corvette. Right: The Safari Shipping Data Report. The original selling dealer was Rosen-Novak Auto Co. in Omaha NE. The dealership, like so many others, is no longer in business. A Google search revealed some background info on the dealer. According to the research, "Justyn Rosen was murdered in front of a Denver police station in 2004 at age 79 by Teresa Perez,a woman 40 years his junior, an employee with whom he had an affair." Nice! I am wondering, for example, if I were to visit the Omaha NE library, if they might have microfiche copies of newspapers from the time that might have an ad for Safari? There's some interesting disagreement here. The shipping report has "The GM Official Production Date" as 7/27/68 but the trim tag (above) has "L26" which translates to July 26, 1968. "TRIM STD" translates to a black interior and "984 PAINT" is Safari Yellow. Trim tags are located in the driver side "A" pillar and is visible with the door open. First Digit = 1 > Corresponds to the GM division that produced the car. 1 translates to Chevrolet. Second and Third Digits = 94 > Identifies the model. 94 translates to Corvette. Fourth and Fifth Digits = 67 > Identifies the body style. 67 translates to Two Door Convertible, 37 would translate to Two Door Sport Coupe. Sixth Digit = 8 > Identifies the model year. 8 translates to 1968. Seventh Digit = S > Identifies the assembly plant. "S" translates to St. Louis MO. Last Six Digits = 426860 > Sequential production number. 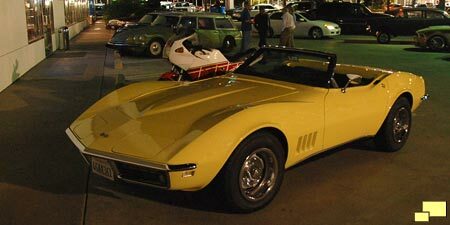 The starting number is 400001, so Safari is the 26,860th Corvette built in the 1968 model year. 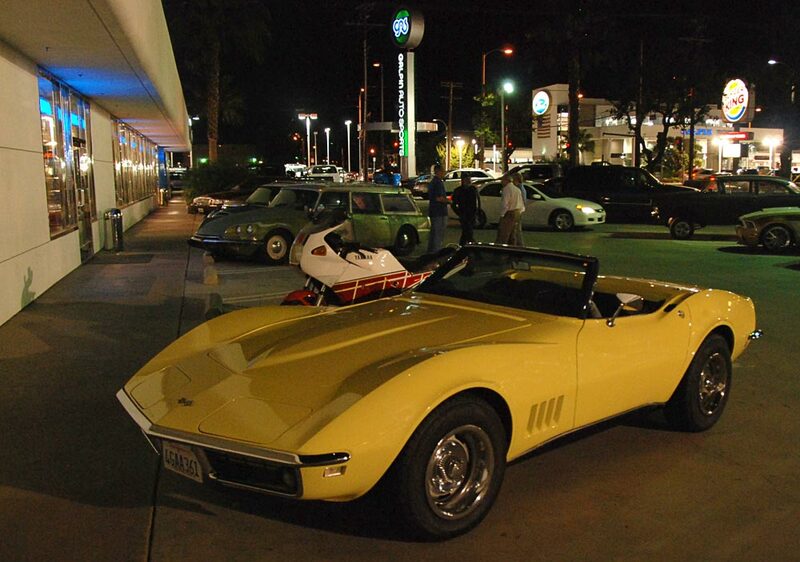 Since there were 28,566 1968 Chevrolet Corvettes built, some simple subtraction tells me that 1,706 Corvettes were built after Safari. This places it as a fairly late production build. Safari is looking good at a Car Night at Galpin Auto Sports in Van Nuys, CA.